Your Guide To Smashing Hills! Here’s what you need to know about running uphill and running downhill. Unless you do all of your running on a treadmill or track, at some point you’ll find yourself going up and down hills. That’s good: Running hills has many benefits, no matter what level of runner you are. Below we’ll look at why you should incorporate hills into your running, the right form to use when running up and down hills, and the best way to make use of hills in races. Although some runners are naturally better at running uphill, and some find their forte is speeding downhill, everyone can improve how they handle both types of slopes. Hills can improve your running form by increasing knee lift, joint mobility, and neuromuscular fitness (how well your nervous system communicates with your muscles). Hills improve muscular strength (your legs’ ability to produce force) and power (the ability to produce a lot of force quickly). Hills provide an added cardiovascular boost. Reduce your risk of injuries as you become adept at not crashing into the ground. Of course, getting better at running up and down hills will also help you in any race with hills. You may have heard that the best way to get to the top is to “lean into the hill.” That doesn’t mean bending your torso at a 90-degree angle. “Just as you shouldn’t lean forward from the waist when running on flat terrain, you don’t want to lean from the waist on hills,” says Pete Magill, a running book author, U.S. masters record-holder, and coach of the Cal Coast Track Club. Imagine that you’re running on flat terrain, Magill says, and adopt a stride perpendicular to that terrain. “This will naturally result in a slight forward lean on the actual uphill terrain,” Magill says, with the lean coming from your ankles. Think about “running tall,” with your head, shoulders, hips, and ankles aligned. Look ahead rather than down. You’ll use your arms more as you lift your knees, but keep your shoulders and arms relaxed, and the insides of your wrists passing near your waist. 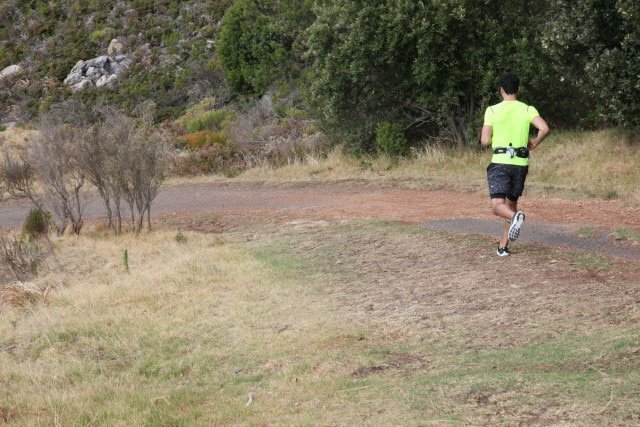 There are two common – and contradictory – mistakes runners make on downhills. Some lean back and brake, which greatly increases impact forces on your joints and causes you to slow. Others take the opposite approach, flailing down the hill out of control (and causing unnecessary muscle damage in the quadriceps). On more intense downhills, Magill says, “you’ll need to find the sweet spot between forward lean and braking based upon your own fitness and experience. Whatever you do, don’t go springing out into the air and dropping that extra couple centimetres with each stride.” If a downhill is so steep that you’re concerned about falling, shorten your stride and decrease your cadence. In the age of the GPS watch, it can be hard not to constantly focus on your pace when racing. Doing so is often not the best approach, especially when running uphill. In his masters thesis on marathon pacing, Olympian Jared Ward found that runners who tried to maintain even pace on a rolling course were less likely to attain a faster qualifying time than those whose pace varied with changes in topography. 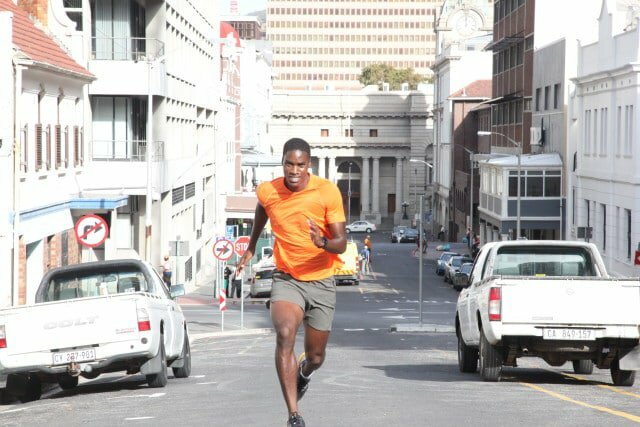 Similarly, although the winners of the faster marathon often run close to even splits for the two halves of the famously up-and-down course, their kilometre splits can have significant differences, depending on the presence of hills. Instead of trying to keep an even pace uphill, focus on maintaining an even effort. Another common mistake: Backing off as soon as you reach the top of a hill. “Continue your forward momentum once you crest the hill,” says Harrison. Harrison says too many runners are too aggressive on hills early in a race. “You want to keep the hills honest, but you also don’t want to cross the redline too early in your race,” she says. “Downhill running significantly increases the intensity of eccentric muscle contractions in the quads,” says Magill. In an eccentric contraction, a muscle lengthens as it’s contracting, causing stress that can lead to almost instantaneous soreness. Focusing on maintaining your effort level on downhills will naturally lead to running faster with less risk of overdoing it. If you know you’ll be racing a course with a lot of downhill sections, practice running fast downhill from four weeks to two weeks before the race. Your quadriceps will probably get a little sore from those sessions, but they’ll gain some immunity to race-day muscular damage.